Crab Boil season opens at Back Forty. BAYSIDE: Tonight marks the kickoff of the third annual installment of the Crab Boil summer series at the EastVillage’s swell Back Forty. 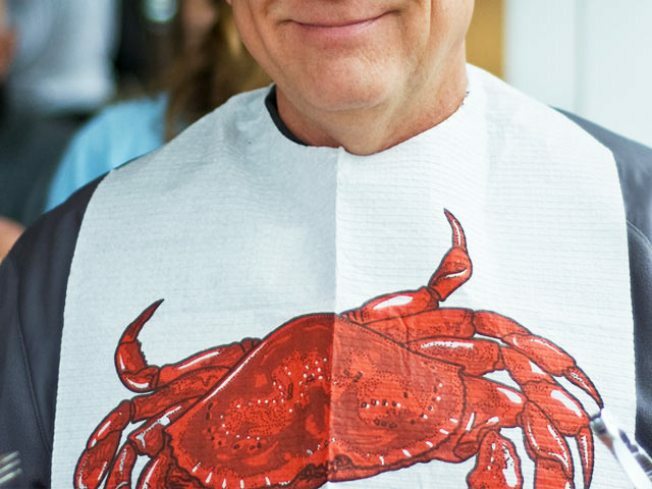 What this means for you: Piles of gorgeous blue crabs steamed in OldBay and beer + newspaper + a mallet + you. Sides and dessert will changes every week, but always feature seasonal garden veg and cobbler. Woof. First seating at 6:30PM. SWEET THING: Four-plus decades after playing wee gigs together as unknowns, Carole King and James Taylor reunite for a massive world tour, backed by their original band the Section. They may be older, wiser, and richer, but they still have unstoppable onstage chemistry, guaranteeing a night of nostalgic good vibes. MSG, 8PM. PLUGGED: Chefs Jacques Pépin and Michel Nischan will go head-to-head at the Hot Plates Live cookoff, proving what dorm-room gourmands have known for a while: You don’t need a six-burner Viking stove (or even gas burners) to create beautiful food. WNYC broadcaster Leonard Lopate hosts and chef/restaurateuse Lidia Bastianich judges the event at Tribeca’s Jerome L. Greene performance Space. 7PM.